Hike your way through Sardinia, the second largest Mediterranean island after Sicily, separated from Southern Corsica by just 13km of sea, the Bonifacio straits. It is stunningly beautiful and unspoilt, the ideal place to enjoy hiking. A wonderful vegetation of myrtle, rosemary, rockrose and sea lavender border the sandy beaches. The white chalk rocks and limestone cliffs give the water an enticing crystalline pale blue colour. In the island’s interior, you will find a traditional land of shepherds and agriculture, rolling hills and meadows bright with wild flowers. In the mountain villages, the older ladies still dress from head to foot in black and the communities are extremely traditional. You will find plenty of local crafts, including hand-made leather goods, ceramics, tapestries, lace and wine. Our hiking itinerary starts in the high plateau of the Supramonte Massif. 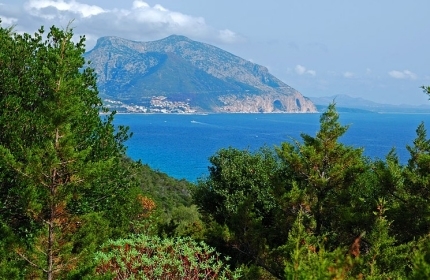 You will see a superb variety of terrain and have a real insight into local Sardinian life. The paths wind through Aleppo and maritime pine forests to reach jagged sea cliffs and rocky creeks. There are spectacular views at each turn.